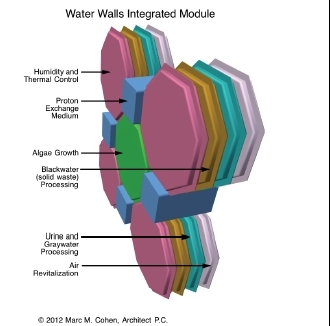 The Water Walls spacecraft wall structure of functional water bags (Credits: NASA). The Water Walls spacecraft concept, designed by Michael Flynn of NASA’s Ames Research Center, aims to achieve lifesupport aboard crewed spacecraft the way nature does – with water. The project, formally known as Highly Reliable and Massively Redundant Life Support Architecture, suggests the use of a hexagonal framework of water-filled bags to form the spacecraft’s walls. The water would protect the enclosed crew from space radiation, but that’s not all. The bags would be filled with filters, algae, and bacteria to provide a complete biosystem, breaking down crew waste products, cleaning the water and air, and providing food. The spacecraft would consist of five water processing elements: waste water treatment, solid waste treatment, CO2 air scrubbing, food production, and radiation protection. Each element would be housed in separate bags, all of which would compose the spacecraft walls. Spare bags could be carried to replaced depleted elements. This is not the first time water has been proposed as a radiation barrier to protect spacecrews, (check out Water and Bombs in Space Safety Magazine’s Winter 2012 issue), but this is the first to holistically address that water’s use. NASA has awarded $100,000 to further development of the project under the Innovative Advanced Concepts program.